At the U.S./Mexico border, U.S. agents are denying unaccompanied minors the right to request asylum, per Vice News. According to reports, agents are physically blocking minors from passing through by forming a line and telling them there’s no more room, thus breaking national and international law. In one case, an asylum seeker’s volunteer attorneys were told they had entered Mexico illegally and forcefully separated from their client. Those risks could be life-threatening. Leaving children on the Mexican side of the border means they’re left up to discretion of the Mexican police and even subject to arrest on loitering charges. That in mind, kids are left with two options: They can hang out and risk being arrested, or they can add their name to the 5,000-person waitlist. The latter option has its issues too, though. To be added to the waitlist, a minor must have original identification documents. Most don’t. Even in best-case scenarios where a child has those papers, they’re not guaranteed anything. 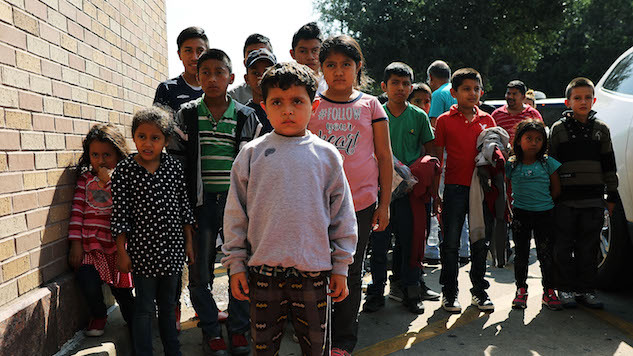 When minors put their name on the waitlist, they’re subject to detention by the Mexican government and may be sent back to the countries from which they were trying to escape. Vice spoke to Marlin, a 17-year-old girl denied asylum at the border who joined the migrant caravan, by herself, to escape a man who was harassing her in her home country of Honduras. Police wouldn’t stop the man, despite her requests. Dilmer, another boy of the same age, faced similar problems. Also from Honduras, his older brother was killed. After discovering the murderers were after him next, Dilmer’s parents urged him to join the caravan and find safety. Coping with being separated from his parents and his brother’s killing, Dilmer fled. He told Vice he’d be dead if he had stayed. Age presents a problem for these kids, too. Minors who express fear of returning to their home countries have significantly greater chances of being let into the U.S. and can receive green cards if they experienced abuse from one or both parents. The longer they sit and wait for their name to be called and ushered through the waitlist, the more their asylum cases fall apart in the eyes of the legal system.